Samara (formerly Kuibyshev) with 1.2 million inhabitants is situated in the east of European Russia on the confluence of the Samara and Volga rivers. Construction work began in 1980 and on 26 December 1987 the first section was put into service between Yungorodok and Pobeda (4.5 km). On 31 December 1992 Sovyetskaya station was opened, the following year on 25 March the line reached Sportivnaya and on 30 December Gagarinskaya. In Feb. 2015, after extending the line to Alabinskaya, the total length is 11.6 km. 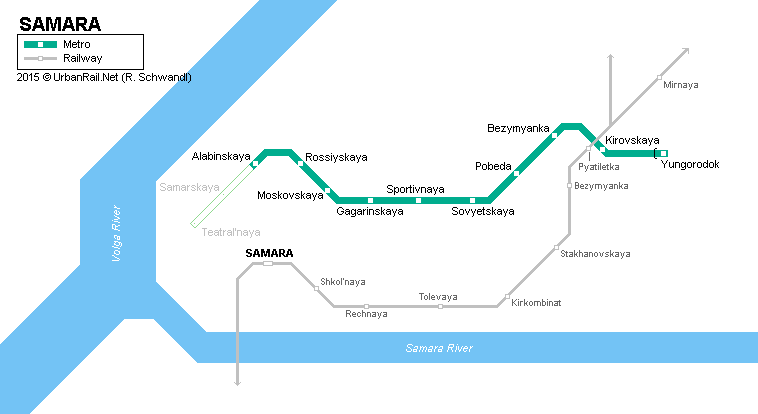 Compared to other Russian metros, the Samara metro's alignment is shallow, with running tunnels built by subterranean construction methods, but stations excavated by cut-and-cover. The following stations are currently planned for a city centre extension: Samarskaya and Teatral'naya. At the eastern end, one more station Krylya Sovetov is planned, but may only be built after the second line has been completed, which is to run from the railway station north via Moskovskaya on the first line.